Here are two ideas if you’re in Franschhoek over the next few weeks. Be sure to book ahead. Pierneef à la Motte restaurant at La Motte wine farm seemed a good, slightly luxe option to take our visitors. The grounds are immaculately kept and the glassed in outdoor section of the restaurant makes you feel part of the garden without being affected by sweltering or chilly weather. The food is cheffy with an eclectic mix of flavours that draw on early Cape recipes, chef Chris Erasmus’s Karoo heritage and plenty of modern influences. It’s visually appealing and the amount of diners clamouring for a table suggests that the formula works. 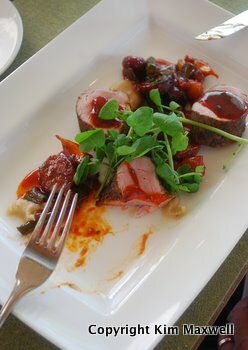 Yet our group of seven felt some of the menu’s braver combinations worked better than others. 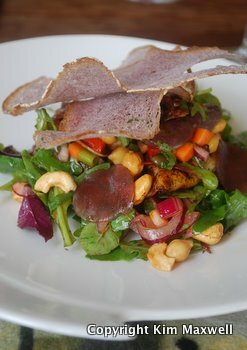 A success: starter (R59) of blackened calamari tubes, chilli sausage and sugar-cured venison loin slivers over assorted salad leaves with crunchy cashews. Ingredients that wouldn’t ordinarily partner each other in a salad, with excitingly different yet not too aggressive flavouring. The menu mentioned a sweet and sour peppadew dressing, and on the plate tasted mildly curried. Slices of Shiraz bread formed Melba toast. Porcini roast venison loin (R155), on the other hand, was eye-catching on the plate. The warthog was tasty, the spearmint and sumac potato dumplings offered unusual flavours, yet two diners found the dish overpowered by an overly sweet tomato-laced ‘watermelon and amber braai sauce’. Desserts were dramatic to look at and satisfying. Pierneef’s textures of chocolate deserves special mention. It’s chocolate in various guises, from a thin chocolate top layer that has to be cracked with the spoon, to playful rubbery strips, a surprise baked fondant and retro peppermint crisp ice cream. Parents can relax in the knowledge that despite the venue’s smart décor and finishes, babies and toddlers won’t upset other guests here. Service in this department deserves special mention as staff go to incredible lengths to make little people comfortable. It starts with designer highchairs and five-star baby changing rooms in the restaurant bathroom, and finishes with a basket of towels on hand for kids –few can resist playing in the outdoor water feature – and even wet clothes being tumble-dried on occasion! The new Maison wine tasting centre and ‘The Kitchen’ eating venue is very close to La Motte so we popped in to have a look after lunch. ‘The Kitchen’ only opened a month ago. We liked the restored historic home that is Maison so much we stayed for a late-afternoon drink on the lawns. Homemade lemonade – nicely tart – and Darling Brew ales were carried out. On the wine side, owner furniture retailer Chris Weylandt has employed a winemaker to make a Shiraz and three white wines in rented cellar space. They are available for tasting in the character-filled interior with modern painted white floors and an interior bearing the shabby chic décor hallmarks of a Weylandts store. Oversized comfy couches, casual wooden benches under old oaks and terribly clever chandeliers made of unlabelled wine bottles impressed. 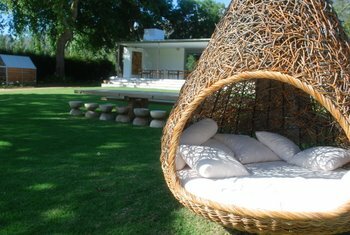 But the star of the show is an oversized hanging chair - a delightful spot for two or three mates to lie back and take in views of tranquil vineyards. A quick squiz through the tapas and regular menu revealed lots of creative dishes to entice. Prices look good too. We’ll be back to try it out. 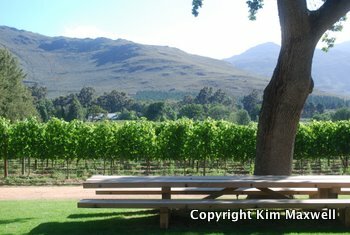 PIERNEEF à LA MOTTE, La Motte wine estate, R45 Franschhoek. Tel 021 876 8800, Pierneef Lunchtime venue. MAISON, R45 Franschhoek. Tel 021 876 2116, Maison Lunch and tapas venue. Bonjour,J'ai vu le film, il est inte9ressant, le sujet est bien choisi, il est assez pctiiaulrer, sauf que il y a plusieurs critiques e0 mentionner : le sce9nario ( les paroles ) n'ont pas e9te9 bien choisis, ainsi que l'e9lement perturbateur n'a pas eu une certaine grande pre9sence ! la notion du temps est un peu mal traite9e mais en ge9ne9ral l'initiative et le travail est e0 un niveau assez bien !